This time next week I'm sure my post will hold some sort of lament about having to go back to work on the following Monday but today that's still a whole week away. There 's still plenty of time for me to enjoy a plethora of favourite things. If you'd like to join in and share one of your Favourite Things, write your own post, link it up and leave a comment so I can skip on over to see what made your heart sing this week. I'm counting on the fact that if you've hung around here for any length of time you wont be easily offended but I'm adding this disclaimer anyway. This post will contain some wanton but necessary profanity. There will be pictures of said profanity. Words I have never used before on my blog. Do not proceed further if you are likely to be upset. My delicate constitution can't cope with losing any more followers this week. My favourite thing for this Friday came by way of the post office (as so many wonderful surprises do ! )I was talking to Little Miss Sunshine recently about my dwindling fabric scraps in certain colours and she said she would send me some of those colours so I can continue with my quilting greatness for the Log Cabin quilt. I also got strict instructions that I was not to make the log cabin scrap quilt into a dog blanket using her scraps (Some people are so bossy !) I was thinking about it actually but since I'm about 65% of the way through making blocks now, I have decided it's a people quilt because it's too pretty for dogs, especially since apparently dogs cant see colours like red and green. 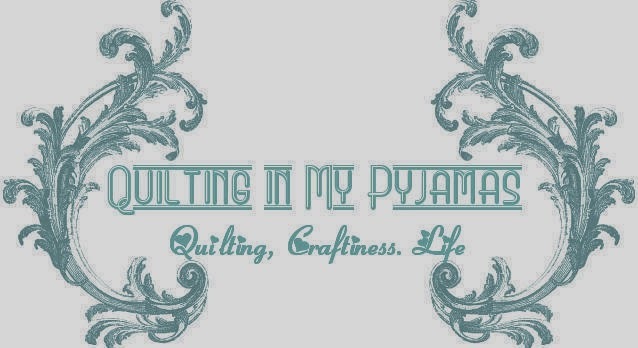 If I decide to practice free motion quilting on the blocks and it all goes pear shaped I could change my mind again. It's a bit like Russian quilting roulette. But a couple of extra surprises were hidden in the folds of the fabric that made me laugh out loud. It's very cool when one of your friends knows you so well. No cute butterfly stamps here. There..now you know Little Miss Sunshine isn't all that ladylike either. I've outed her . The carefully crafted image she has worked hard to present to you all has been shattered. Looks like my work here is done. Have a fabulous Friday! I've been given some post-its to put on things that say sh*t and w*nker !! Too funny! That Marg doesn't fool me at all ! Lol! Right up my alley ;). You know I am a total potty mouth. LOL! I need a t shirt with that on it. So much time and effort would be saved if I didn't have to continually state by state of mystification with so much of what goes on in this world around me. I spied some very cute purple spot in your yummy pile of fabric. Oh I forgot to say how shocked I am....tee hee. I love those Typo stamps.....In fact, I love most of their products. Your post had me laughing. I'm not looking forward to going back to work on Monday, either.....Some of the little treasures I'm getting this year are "interesting". Too funny! Too bad they can't go into work, I know numerous uses for them there. I will admit you had me a bit worried at the start of the post as to what your favorite was this week. By the way, all thoughts of work are banished until you wake up the Monday you have to go back (well maybe for an hour on Sunday so you know you have clean things to wear to work). I love it, and I want a set! Of course, now that I don't work in a cubicle anymore, there's not much that's effing urgent anymore, but still. They look like loads of fun! I am shocked and upset. Little Miss Sunshine??? All my visions of her have been shattered. I might have to give up reading all blogs. but seriously, maybe I should get a set of those for my boss .. he might like them -- but they'd have to be in red for him. WTF ? I'm an angel! Somebody at Australia Post must have stuffed them in your parcel by mistake or to incriminate me. You didn’t deny it when I thanked you....there’s no point in playing innocent now ! Plus you just said WTF ....I rest my case. Guilty! what's so bad about We Talk Funny? i just linked my 2nd friday post ... thanks for the party !!! Every else has said it but I have to too - WTF!! Ah it's so good to be able to come over here and say what we like! Those stamps are too f%^&ing funny!! Those fabrics are so pretty too. and now your quilt will be extra special because it contains some Bff ( best friend fabric). Happy stamping!! I want the WTF one for work we have a lot of clients that that one would apply too. Great FTF. Love those fabrics. Just got back from party supply buying... There goes the grocery shopping budget for the next month. Hooray for the post office! OMG I have to have these. You don't get anything done here in CZ unless it has a stamp on it. Only thing is they wouldn't know what WTF meant! By the way, I'm not at all surprised by Marg - we all know what she's like! Now you just need a FFS stamp and you have all situations covered. Just last week I told Mrs. H we need tee shirts with WTF ... a stamp would get much more use!!!! I bet you'll take them into work anyhow!!!!! Your dogs already have a lovely quilt, and they seem okay with sharing it. There's always that awkwardness with making siblings something isn't there... making sure they're fairly equal. You'd need to make two new ones. Easier to just keep it for yourself. You haven't dropped the f-bomb before? I love this...the post.."we talk funny" would apply to the Canadians here in Florida...WTF is perfect for some instances for sure. Oh poor you going back to work in the middle of summer too! you better take the stamp for some days when it just fits the situation. "I have started stamping all our bills with the WTF one and returning them unpaid back to the senders...."
HA HA HA HA A HA HA HA!!! I can't stop laughing!!!!!! No....I wouldn't share those gorgeous fabrics with the dig either, they are definitely human fabrics. Love those stamps! Names can be very deceiving. I think we could all do with a set of those stamps. Those are gorgeous scraps! Lucky you. Yep I,m laughing to that you stamped the bills and posted them back to where they came from....wonder if I can do that to the telsta exchange that I spent an hour on the phone to this week only to be told that I have to do it again next week because they couldn't help me till after a certain date WTF??? Your post gave me a good belly laugh. Love the stamps. I can see so many possibilities. Fabric and stamps -- nice gift!? That's funny! I NEED one of those...really...really bad!! Thank you so much for the belly laugh!!!!! Those fabrics are gorgeous! The profanity I can't comment on. Friends who you know well, that I get! Great FTF! Love the fabrics and the stamps.